Above: First-day of Tour Divide with Dad. Kearsarge Pass in the Sierra Nevada. Skyler Johnson is speeding down the road to outdoor adventure, and she has no plans to slow down any time soon. That road has so far taken her from her birthplace in Florida to the western US, Canada and Europe, but she always comes home to the Adirondacks, where she takes advantage of everything the area has to offer for an outdoor fitness enthusiast. She credits her dad, Brian, with stoking her love of all things outdoors. In Florida they lived on a large piece of property, where she and her sister spent time outside from dawn till dusk. She also started horseback riding at age five, and though she stopped pursuing it seriously in 2012, she still loves to get out for an occasional ride. Then, when she was 11, the family moved back to her Dad’s hometown of Adirondack, a small hamlet on the east shore of Schroon Lake. The village is only a stone’s throw from the Pharaoh Mountain Wilderness, and she says her outdoor sports life truly started with the move north. Since then she has taken up hiking, running, kayaking, and cycling in the summer. In winter, it’s snowboarding and snowshoeing. “Mostly everything that you could do up here, I’ve tried,” she said. But she eventually warmed up to the wealth of possibilities to get outside in the mountains. Her parents took the girls snowboarding at Gore Mountain, and in warmer weather they would go out with their father on his daily morning run. But eventually it was time to head off to college, and she enrolled in equine studies at Cazenovia College, a small private school near Syracuse. She was there for a year, and then went to several other schools before graduating from Florida State with a degree in English. It was just after graduation, in August 2015, that her outdoors pursuits shifted into high gear. Her dad called to congratulate her, and during the conversation he mentioned, “I saw this race out west.” It was the Tour Divide, an annual ultra-mountain biking challenge along the Great Divide route that hugs the Continental Divide. Starting in Banff, Alberta, riders head south along dirt roads, jeep tracks, and off-road trails to finish in Antelope Wells, NM, after nearly 2,750 miles and almost 200,000 vertical feet of climbing. A winter spent bartending in Florida netted her enough savings to fund the trip, and in April 2016, she and her best friend Melissa headed north with full packs from Campo, Calif. 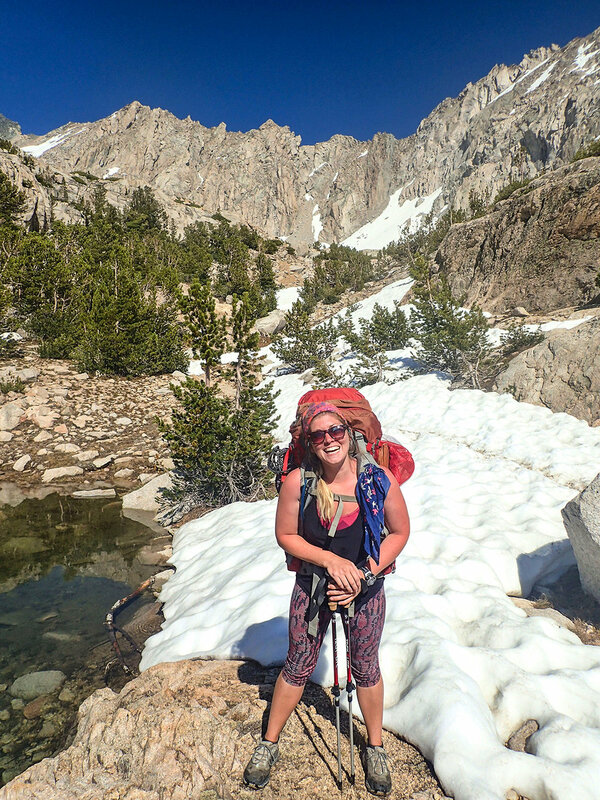 In the first six weeks, they put over 400 miles under their boots before Melissa headed home, leaving Skyler to forge ahead, sometimes accompanied by the various friends she had made along the trail. Back in the Adirondacks, it didn’t take long for Skyler to start thinking about another adventure­ by becoming a 46’er in one season. In April 2017, she and her friend Annie began bagging peaks between days working construction for her dad and bartending part-time. “When I wasn’t working we were usually hiking,” she said, and eventually they were on the trail three times a week. They eventually finished their challenge on the summit of Mount Marcy in November after some hard days, including one weekend spent on the Great Range Traverse, which includes Lower and Upper Wolf Jaw, Armstrong, Gothics, Saddleback, Basin, Haystack and Sawteeth. “That was a VERY tough weekend,” she remembered. So far in 2018, Skyler has finished a five-country trip to Europe and a three-week rafting expedition through the Grand Canyon with a group of fellow rafters from the Adirondacks. She said the trips left her awestruck by the beauty of the world, and with many new friends. Dave Kraus (dbkraus@earthlink.net) of Schenectady is a longtime area cyclist, photographer, and writer who wishes he had half of Skyler’s energy. Visit his website at krausgrafik.com.